Because GX3 is a physical space that extends into the virtual spaces of twitter, Facebook, Google+, etc, one of the things we should provide is space for in-person networking and socialization for our POC attendees. 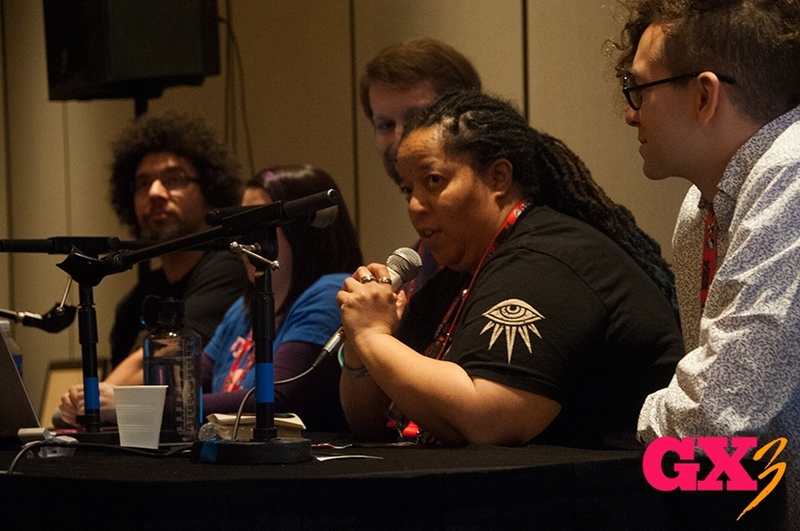 GaymerX seeks to make the gaming world safer and more inclusive to marginalized people, especially those in the gender and sexuality spectrum. Creating Better Practices for safety and inclusiveness in physical and online gaming spaces. This can mean rules and enforcement but more-so helpful guidelines and tools for people to interact with one another as well as exposure to rarely discussed social concepts and issues that help people relate and empathize with one another. GaymerX convention staff asks that all attendees respect and observe this decision to make a safe space available for our POC attendees. This is the first year we will have a POC safe space for our attendees, and your feedback will only help us improve as we move forward in making GX an even more diverse, welcoming and safe space for you. Questions, concerns or other issues can be directed to diversity@midboss.com and will be answered by our Diversity Liaison, Tanya DePass. I’m really, really happy to announce that I am part of the GaymerX staff as the Diversity Liaison for GX3! GaymerX seeks to make the gaming world safer and more inclusive to marginalized people, especially those in the gender and sexuality spectrum. This is handled in three major ways. Making Progress Fun is a big factor in the way that GaymerX does things. When people are genuinely excited and engaged by a concept or a technique they are far more likely to learn it and put it into practice. Gaming, socializing, and partying can be effective avenues to test out social conditions that favor inclusiveness and conflict resolution. Creating Better Practices for safety and inclusiveness in physical and online gaming spaces. This can mean rules and enforcement but more-so helpful guidelines and tools for people to interact with one another as well as exposure to rarely discussed social concepts and issues that help people relate and empathize with one another. The GX Convention is a yearly event where all of GaymerX’s work can be put into practice. It is a physical space where people can meet and interact in a different way than they would at a mainstream gaming event. When people know that the event’s audience, volunteers, staff, vendors, and guests are all supportive of their identity and open to discuss conflicts, it creates a unique positive atmosphere of comfort and inclusiveness. So how can you contact me if there’s a problem/concern/question about diversity and the convention? You can email diversity@midboss.com and I’ll get it. I’ll do my best to respond within 1-2 days. If it is urgent please note that in the body of your message so I can try to get back to you on the same day if possible. I’ll be at the convention in San Jose December 11 – 13th, 2015 roaming around, go to and doing paneling. If you need me for anything at-con, I’ll let folks know how to find me there. Last of all, don’t forget panel and RPG event submission is open until September 1st! Looking forward to meeting you all in December!